But as you can see in this picture, I haven’t figured out how to adjust the straps and such. 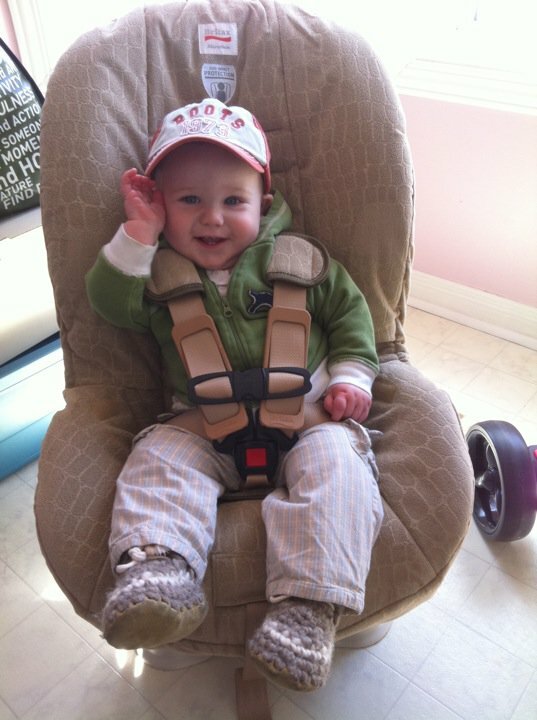 With the last car seat, A. was the one who did all the strap adjustments. I suspect this is because beyond the first two weeks, I was unable to lift the car seat with Budsie in it so A. did all the heavy lifting and straping in and whatnot. Which was nice. This time around, however, I’m determined to be more useful. And that means learning about the car seat. I’m told this is a pretty straightforward car seat. Which is why I’m tempted to just not bother learning anything and to just see how it goes when we are on vacation this weekend. Tempting, very tempting. But I think Future Ezmy, the Ezmy who has just gotten off a plane with a 10 month old who likely hasn’t slept and is now up waaaay past his bedtime, might have a few choice words for me if I don’t figure this bad boy out today, while the baby is well rested and beetling around the living room. So in the interest of not having Future Ezmy hate me, today’s resolution is to figure out all of the bells and whistles on the shiny new Britax. Update on previous resolutions: It turns out that Googling “purse mender ottawa” gets me my own post. Huh. There is a twitterer in Otown who does them too- and individ. consults.. I can’t remember name but @refashionista would know. After this post I had a dream J grew a foot and I had to buy and learn a new seat. Obviously, I obsess too much. There is no job I hated more than installing car seats. I am so grateful to be done with that stage of life!